Duke Energy crews are working to restore power to the Florida Panhandle but are encountering many challenges along the way. CARRABELLEC, Fla. — Duke Energy crews are working to restore power to the Florida Panhandle but are encountering many challenges along the way. Crews have been in the Panhandle since Tuesday and are now assessing damage. They said they are using a combination of helicopter, drone & ground support to quickly and safely determine which crews and equipment are needed for repairs. "As soon as the assessment is complete our restoration work will begin," Duke Energy said on Twitter. 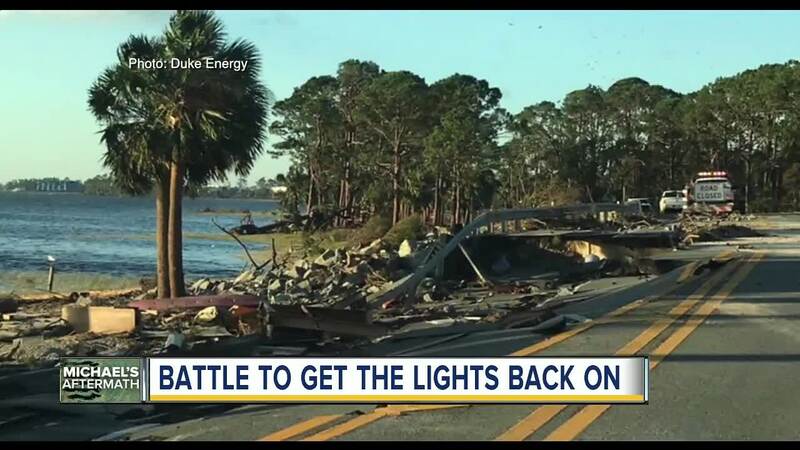 In Carrabelle, crews have witnessed catastrophic damage, road closures and debris that have made for challenging conditions, according to the Duke Energy Twitter Account. Crews said they will continue to work as quickly and safely as possible to get power back on. However, in some places, specifically Mexico Beach, many parts of the power infrastructure have been washed away. Also, entire homes have been wiped away. "There are people there that we won’t even be able to restore power because there’s nothing left to restore power to," said Ana Gibbs, spokesperson with Duke Energy. Lineman are also seeing first responders who are working to get people who may be trapped inside buildings destroyed by Hurricane Michael. Duke Energy is also issuing a warning about navigating power lines that can be hidden by debris and standing water. They are now asking anyone trying to get back to their homes and businesses in the Panhandle to please use extreme caution while out in damaged areas and to stay away from power lines that have fallen or are sagging.